Valentine’s Day happens in two days, and if you haven’t found someplace or some way special to spend the day with your significant other, take a look at these Valentine’s Day 2019 promos. For the couple who want to try a new place to spend Valentine’s Day, a filling dinner date with a view is what’s waiting for you at the Encima Roofdeck Restaurant at the City Garden Hotel Makati. This spot for couples offers their promo at P1,349 per person. That will get you a four-course meal with a live acoustic band. This also includes a photobooth when you’re done taking in the romantic Makati skyline view. Get your table reserved now. 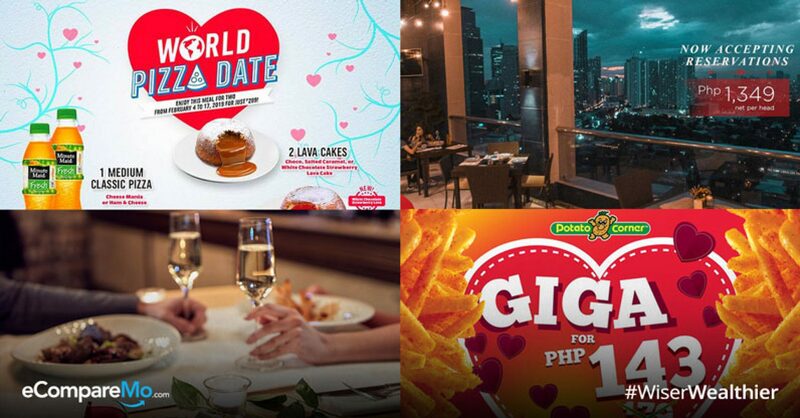 For the couple who just want to stay in and be comfortable, Grab is providing free delivery on three GrabFood orders, with a minimum single receipt of P200. This is valid within Metro Manila and Cebu, so give in to your cravings now. Just use promo code FEBCRAVEFD when you order. Promo runs until February 13, 2019. To the couples who aren’t afraid to show their love no matter how cheesy, surprise your loved one by hiring a Grab Bae! You will be notified of the Grab booking, as usual. It comes with a Kitkat bar, a teddy bear, and Grab vouchers. For couples who are very particular of set and setting, Sofitel never fails to set the mood right, no matter the occasion. The Sofitel Sunset Bar faces Manila Bay, where you can have al fresco dining and get serenaded with live music. This Valentine’s Day, they’re giving you the Sunset Bar’s Love By Design Valentine’s special. For P20,000 nett you get a four-course dinner for two, a bouquet of three roses, a bottle of champagne, and a box of pralines. You will also enjoy a performance from a live violinist. You can also try the Valentine‘s at Sunset Bar special dinner buffet, which is priced at P8,000 per person. You and your special someone can enjoy their signature barbecue dishes along with an upgraded buffet selection. Drinks are unlimited, with choices of iced tea, local beer, special cocktails, and the Wine of the Month. For the busy couple looking to squeeze in some rest and relaxation on their date night, there’s the I’m Hotel Onsen Spa’s Valentine’s Day promo. Indulge in three hours of treatment, which includes a chocolate body scrub, aromassage, and Japanese facial for P8,000 per person. The package comes with a dinner buffet at The Common Good, available from 4-10 p.m. The promo runs the whole month of February 2019. For the couple who have zero fuss about where to eat and just want to enjoy each other’s company, there’s World Pizza Day by Domino’s. From February 4 to 17, 2019, starting at P289, you can get one medium pizza, 2 bottles of Minute Maid Fresh, and 2 Lava Cakes. For the couple who love to share and love fries, there’s more than enough for two with Potato Corner’s Valentine’s Day promo. For P143 you can enjoy a giga sized order of Potato Corner fries. This promo is available from February 12 to 14, 2019. Sebastian’s Ice Cream has released four new ice cream flavors exlusively for the month of February. Proclaim your status with the ice cream flavors: Matinong Boyfriend (almond butter-milk chocolate ice cream with blackberry compote ripple), Matinong Girlfriend (cheese ice cream with white chocolate-dipped potato chip, pretzel, and multigrain chip bits), Closure (chai ice cream made from a black tea base infused with cloves, ginger, cinnamon sticks, and black peppercorn, and Unresolved Issues (ampalaya sorbet with candied ampalaya bits). The valentine ice cream flavors are available at Sebastian’s in Regis Center, Katipunan, Ayala Malls Vertis North, and The Podium. In addition, there’s another Valentine’s promo exclusive to the Podium branch. Buy any two of their Grilled Mozzarella sandwiches, and you get two glasses of cold-brewed iced tea for free.